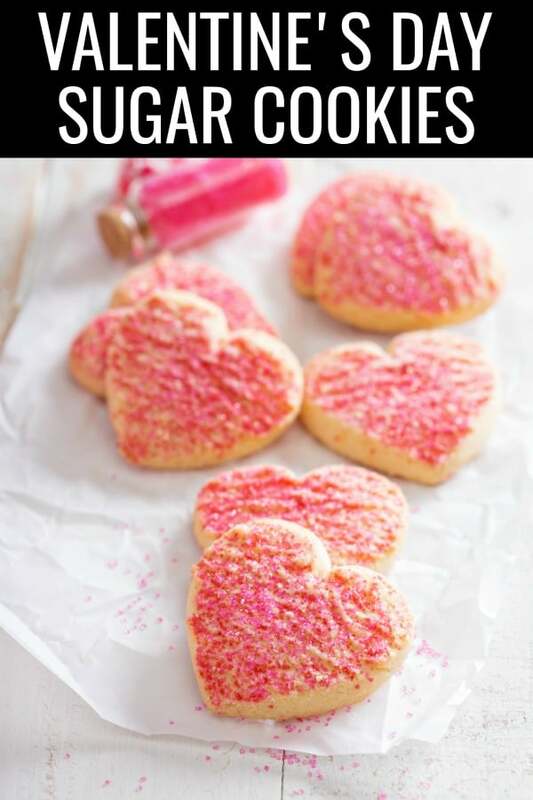 Make completely homemade sugar cookies for Valentine’s Day. Learn how to freeze sugar cookies and my favorite ways to decorate them. Pour some love into a batch of sugar cookies. 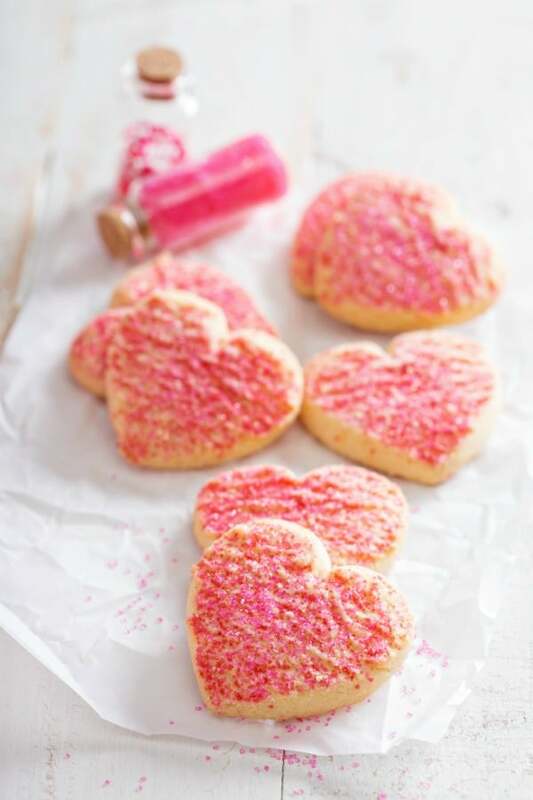 These Valentine’s Day sugar cookies are soft, beautiful, and incredibly easy to decorate. The recipe is at the end of this post, after all the helpful tips and information you’ll need for the perfect batch of cookies. For me, baking takes longer than cooking. I can throw together a dinner recipe and it isn’t as difficult or particular as baking. But screw up something seemingly small in a batch of cookies could result in literal ruin. So when I bake something, I am honestly baking it with love. All that time I spend paying attention to the details of the recipe, I am thinking about how much it will mean to my kids. When I have the time, I really enjoy making sugar cookies and cakes from scratch. I am able to control how soft they are and how large they rise. It’s all a part of baking with love. The best cookies to make for Valentine’s Day really are sugar cookies. They can be decorated and personalized for your kids or loved ones. Plus that combination of light cookie with bright colored frosting makes everyone smile! These are the tools I used as I made my cookies. They sure made the entire process a lot easier. I’m sharing the tools I used with my affiliate links. If you purchase something through my affiliate link, I earn a portion at no extra cost to you. There are two types of people in the world: those that like crunchy sugar cookies and those that like soft, chewy sugar cookies. My family and I prefer crunchier cookies. We love dipping them in milk and prefer how the crunchy cookies don’t fall apart in the lunch box. If you want to make soft sugar cookies, follow my recipe and just let them bake for less time. If they bake for 8-10 minutes, they will set as they cool. What is the best frosting for sugar cookies? My favorite frosting for sugar cookies is my homemade buttercream frosting recipe. It’s super easy and you can control how thick or thin it is. This recipe is wonderful for all occasions. You can use it for Christmas cookies, birthdays, and even class parties. Tie-Dye Dough – marbelize the cookie dough with pink food coloring for a fun effect. Fun shapes – Use a variety of cookie cutters. Use letter cookie cutters to spell out L-O-V-E or use arrows. If you want to enjoy these cookies later, they will last a lot longer in the freezer than in the fridge or counter. Place baked cookies in a single layer on a cookie sheet that is lined with parchment paper. Freeze the cookies on the sheet for one hour. Transfer frozen cookies to a large zippered freezer bag. Return bag to the freezer. Cookies will last about 3 months if they are stored in an airtight bag or container. Here is my recipe! It’s tried and true and never fails. If you make them, either leave me a comment here or tag me on Instagram @liveluvtx. 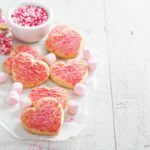 Make completely homemade sugar cookies for Valentine's Day. Learn how to freeze sugar cookies and my favorite ways to decorate them. In a medium bowl, cream together the butter and sugar. Add the eggs, vanilla, and heavy whipping cream to the mix. In a separate bowl, mix together the flour, baking powder, and salt. Combine the dry mix and wet mix and stir just until combined. Be careful not to overtax. Cover the dough and chill at least 3 hours. Preheat your oven to 350 degrees F. Lightly spray a baking sheet with cooking spray or line with silicone baking mat or parchment paper. Lightly flour a surface and then roll the dough out to approximately 1/4 inch thickness. Use a heart-shaped cookie cutter and place cookie cutouts 1 inch apart on the prepared cookie sheets. If you’re using colored sugar, sprinkle before baking. Bake for 10-12 minutes in preheated oven. Allow to cool for 2 minutes before transferring to wire rack. Note: If you want chewier cookies, only bake for 8-10 minutes. The cookies will set as they cool. The process for gluten-free sugar cookies is almost the same as my recipe. The only difference is you will need gluten-free flour and xanthan gum. This is my favorite recipe for gluten-free cookies. Here are some more fun ideas for Valentine’s Day from Live Love Texas. 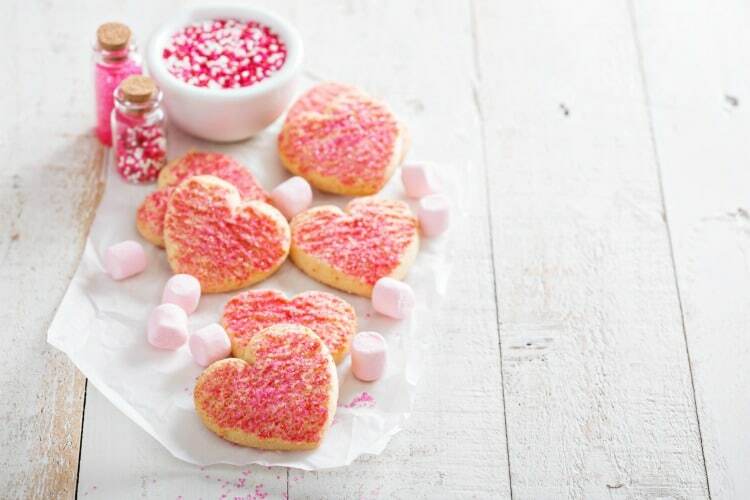 Make sure to pin these heart shaped cookies for later! I think I need to whip up a batch tomorrow for the big day! 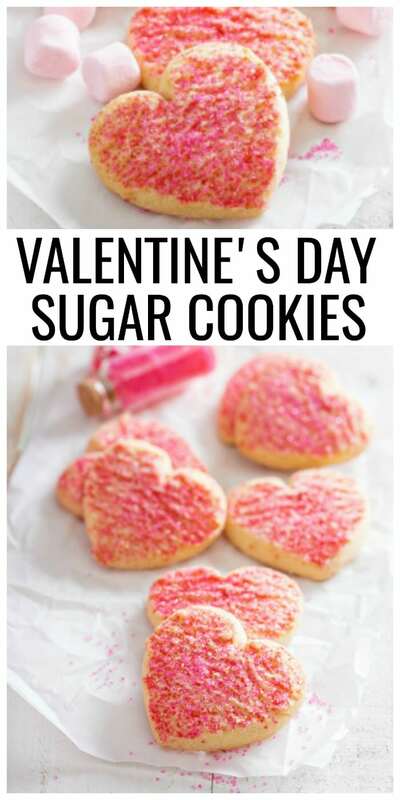 So pretty and perfect for Valentine’s Day – will make these for my kids to take to school! I love a nice sugar cookie with extra sprinkles. I’d love to make a batch!